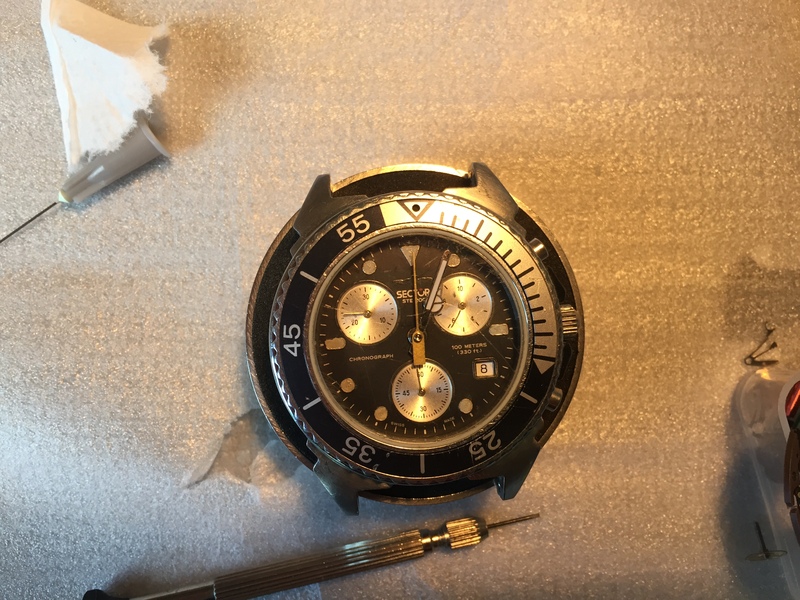 This post is about my efforts to restore my Sector STE200 watch that died because of water ingress. Here is the first part of the post. I searched everywhere for a used STE200. I found one listing in Brasil. 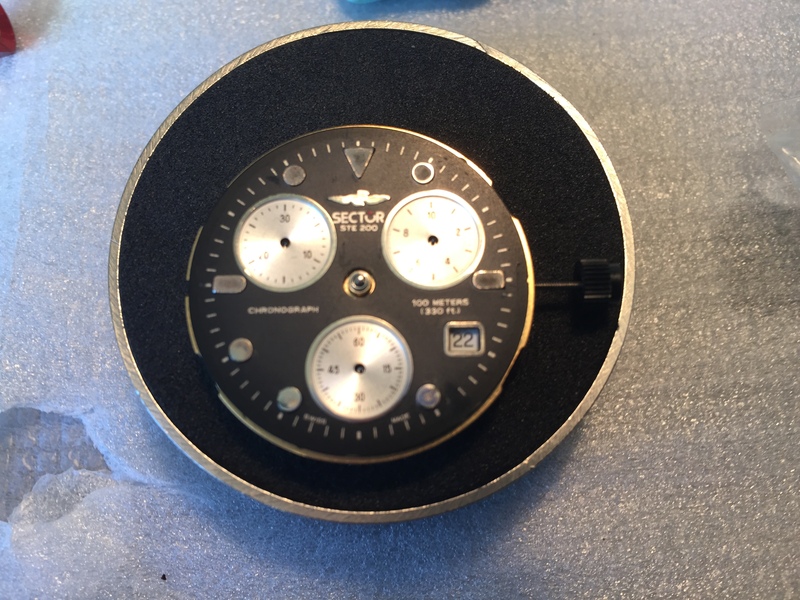 Hmm… I then found an Italian seller who was selling a Sector movement only. For Sector 155 chrono. It seemed similar enough. 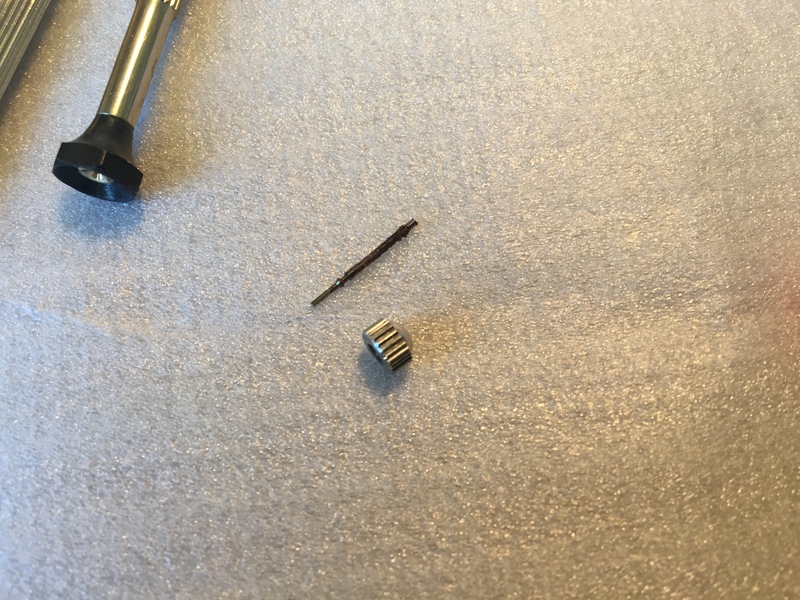 The diameter was about the same (the difference was 0.2mm). The height seemed ok. So I ordered it. It is an ETA G10.711. Ok. The face and the hands are atrocious, but I figured I would buy another set. Then I read the reviews for G10.711. And they are not favourable. Really, as far as possible away from favourable. The most positive thing people could say about this movement is that ETA managed to cut costs extremely well and still charge through the nose for it. Never mind. I looked up specifics for G10.711. Hand sizes are here and dimensions are here. I went to cousinsuk and ordered the correct hands. Cost me 10 pounds. That is fine. The original hands were beyond repair anyway. 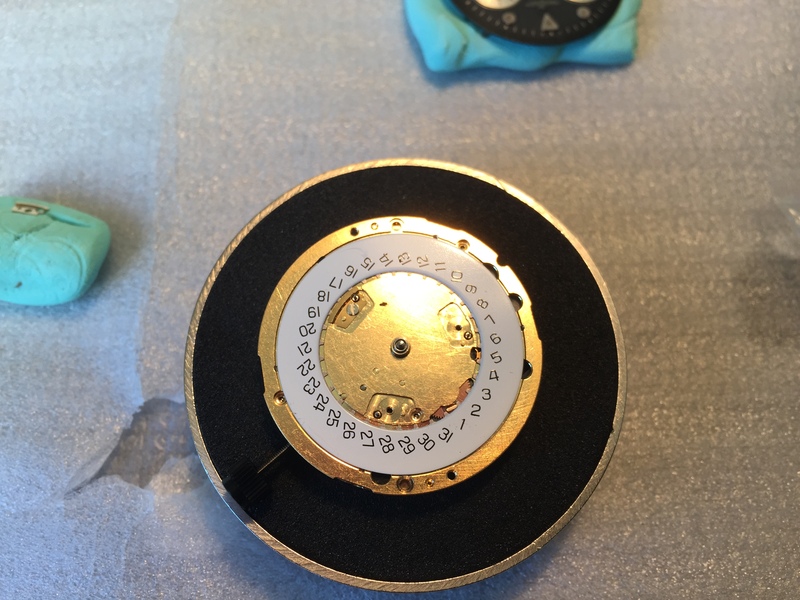 I then looked more closely at the G10 movement and look, there is no way to attach the old dial to it. I mean there might be, but not the same as in the previous movement. 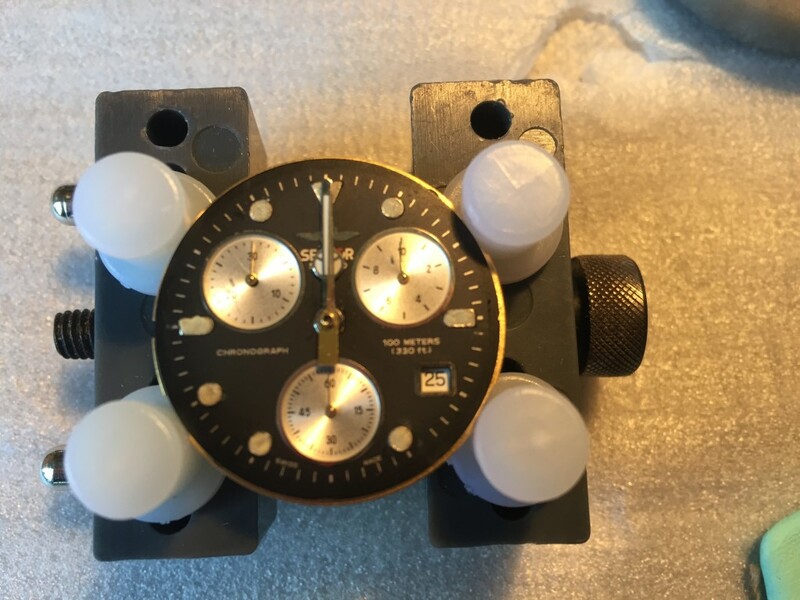 You can see here how the dial was attached previously (they even helpfully provided little orange boxes around the important bits). Oh, but then I realised that the previous movement was ETA too. Specifically ETA 251.272 (it says so in the back of the ruined movement). I wonder if I can get ETA 251.272 anywhere… I can! At cousinsuk. And it is not too expensive. about as much as the G10.711 cost. But the 251 is better quality by far. Cool. I don’t want to rush too much though – perhaps the G10 can still be adapted. I mean, it is not like I was planning on using the watch. I just wanted to repair it and put it into the display case. So, it does not much matter what kind of movement is in it, I won’t be using it anyway. I figure I’ll wait and see. I get the movement and I immediately have two issues. (a) The dial is glued to the movement, so I would have to keep the white and beige atrocity. (b) The movement does not fit into the case. Oh well. I buy an ETA 251.272 from cousins the same day but I have another issue. The large chrono hand is not available. So I order everything else (hour and minute hands). 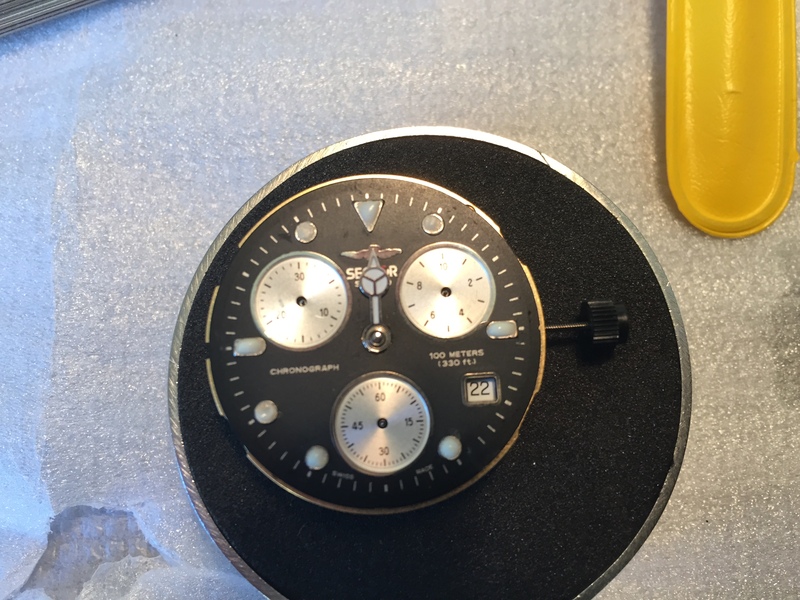 I figure I would reuse the seconds hand and the small dial hands. The movement and hands arrive the next day. I put the dial on and realize that the date wheel is not properly aligned. The numbers are not slanted and they are too big. See? 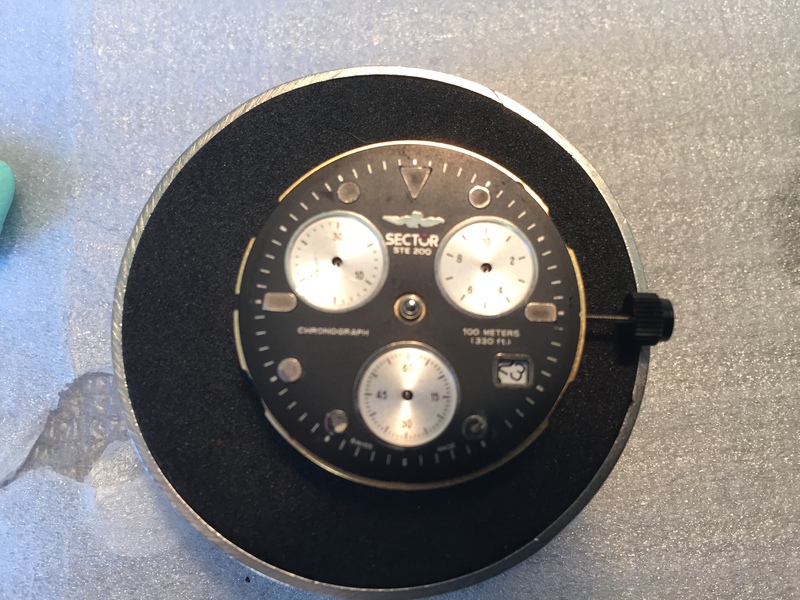 Pay no attention to how crappy the dials and the lume looks. I am cleaning that up after I fixed the date. I replace the date wheel with the old one. I know it was sensible not to throw it away. 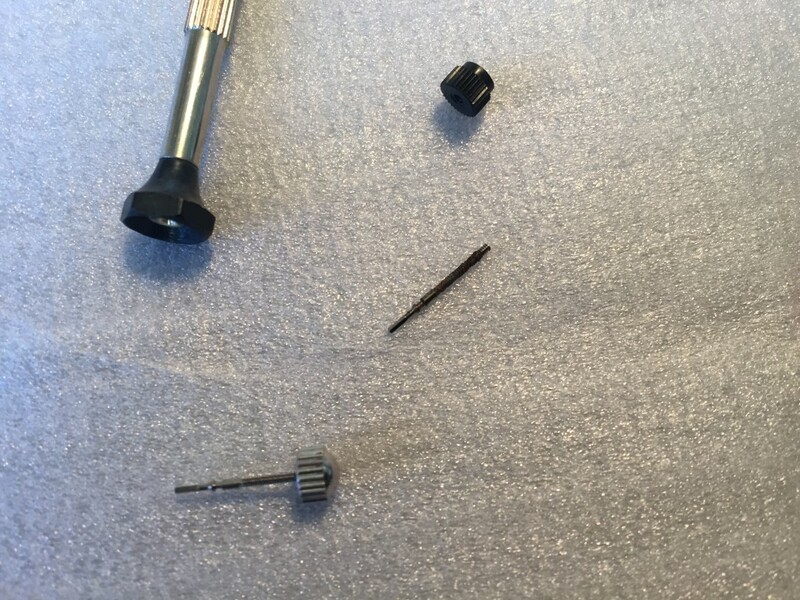 The way to replace the date wheel is to unscrew the three little screws next to the subdial pinions and then remove the little half discs that hold the wheel in place (it then just falls out). Here is the end product. Old wheel, new movement. It now looks a lot better. The date. Not everything, yet. 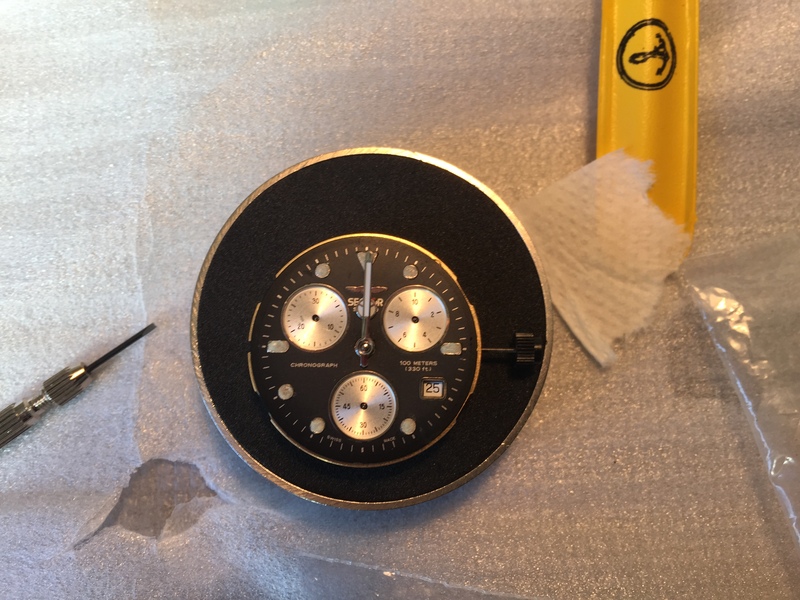 Adding the hour hand and re-luming. Adding the minute hand and realizing I have a problem. The minute hand hits the lume and spreads it around. DOh! 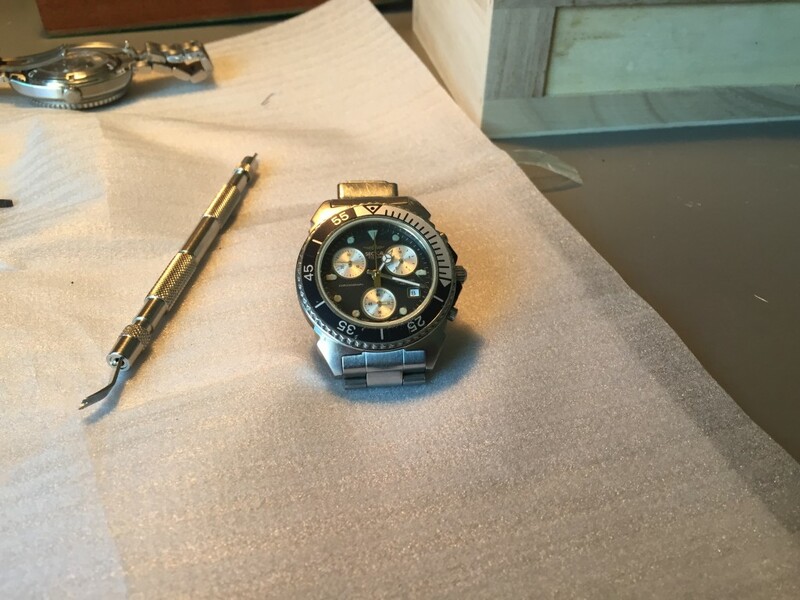 I re-lume again, and align the hands. This is fiddly. You need to do it several times. The first time the problem was that the date changed at 4am, which I did not like. So I set it to start changing at 24:00 and completely flip at 1:00am. But then I realised that the minute hand and hour hand were not perfectly in sync. When the minute hand is at 12, the hour hand should point exactly to a specific hour not between the markers. So I did that and had to reset it a few times. But when satisfied, I added the little hands too. The thing is, I screwed up badly. 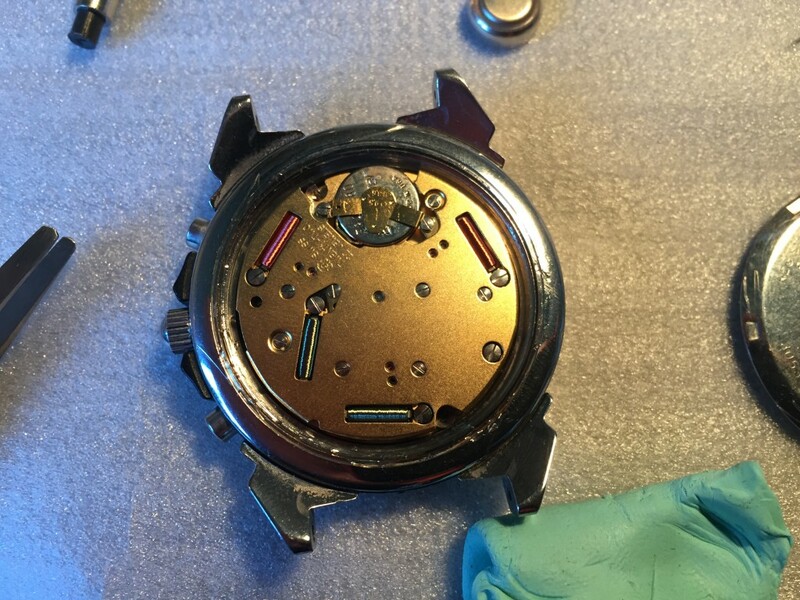 I have no idea where the hands from the old watch are. 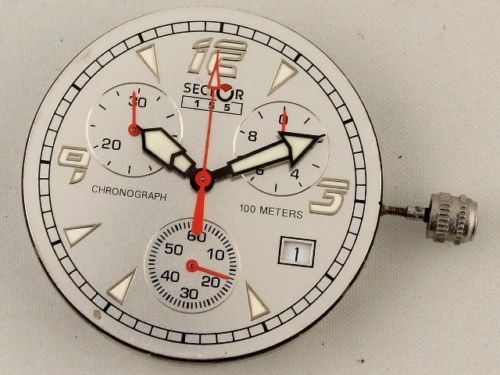 The chronograph seconds would be very useful right now. I cannot buy it – can’t get it. And the one from G10 does not fit. So I left the one that came with the movement on, but will be changing it as soon as I can. Now I need to replace the stem crown. The old stem is rusted. Note. I need to thoroughly clean the stem tunnel. First, remove the crown from the old stem. Then remove the plastic crown from the new stem and replace. Voila. Put the movement in the case. Screw it in (two half-moon screws), put in the stem, put in the battery. Put silicone grease on the gasket, put the gasket on the back cover and close it. Turn the watch around and … We have Lift-off!! I put the bracelet back on. And have it pose for a picture. 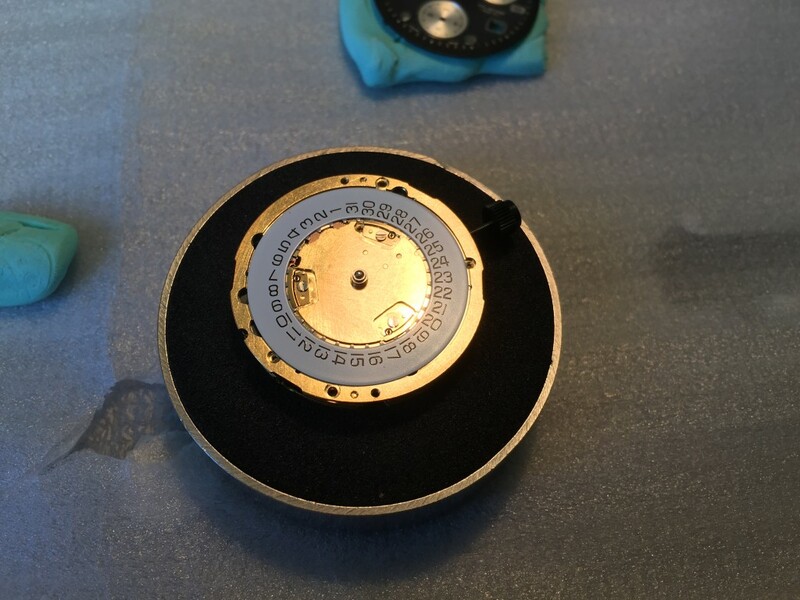 I hardly need to point out that the object of the exercise was not to have a perfectly restored watch, but rather to not give up on an object that has been with me for a long time. It works. And they said it could not be done. Sure, it could be made prettier and restored better. But hey, I did it on my own for me. And that is quite cool. Clean the stem tunnel better. I get why you did this, I still think your quite mad but i salute your unswerving dedication to madness! Well, I’ll say the same thing I said to my wife, who initially didn’t approve of this hobby. Stop attempting to hack my page, please.